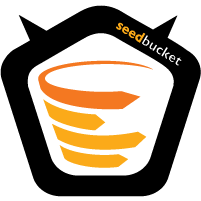 Seedbucket was developed in-house by Seedboxes.cc, in an effort to be an one-stop modern alternative for your day to day seedbox management. It has an integrated state of the art File Manager and an integrated Torrent Client Web UI. Our plan is to keep improving seedbucket very often and keep adding features in order to make it as user friendly and useful as possible! 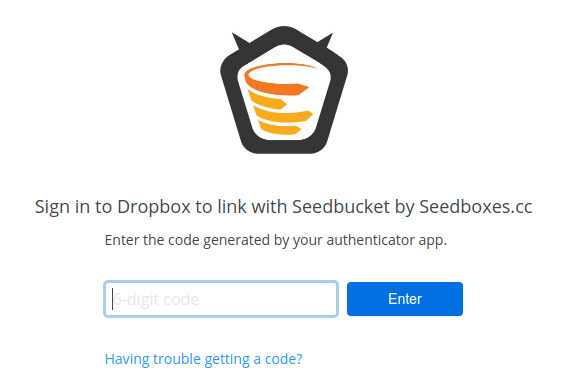 You can install Seedbucket with ONE click from “Installable Apps” in your client area. The application will be pre-configured and ready to be used as soon as installation completes. 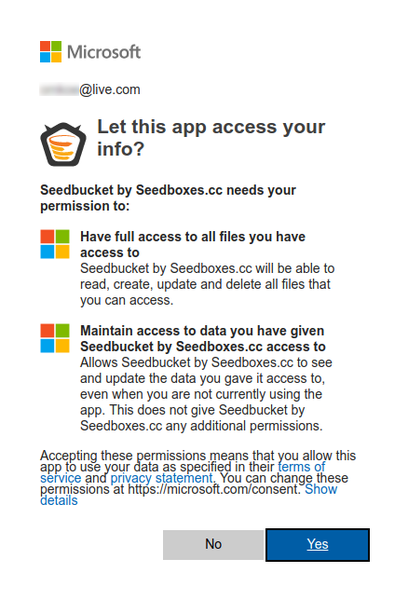 Afterwards, just click the "Go to Application" button and a new window will open with your seedbucket. Dashboards is still under heavy development but the idea behind it is that you will be able to setup a custom layout with a combination of individual components. 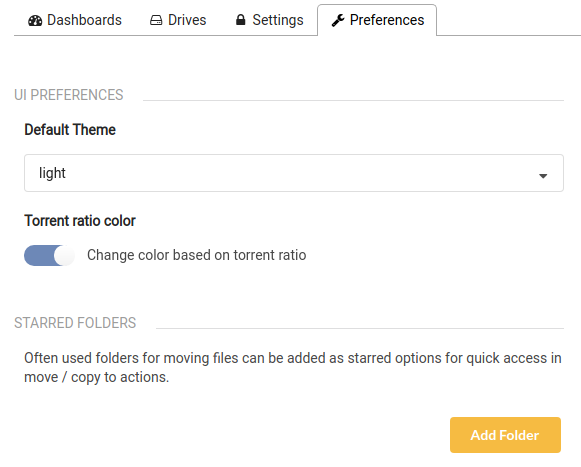 For example, you will be able to create a split layout which on the left side will have a file manager with your local files and on the right side your torrent client. However, this is not fully ready yet at the moment which means you are currently limited to connect an external storage drive and manage its files. We currently support Google Drive, Dropbox , OneDrive , FTP and SFTP. 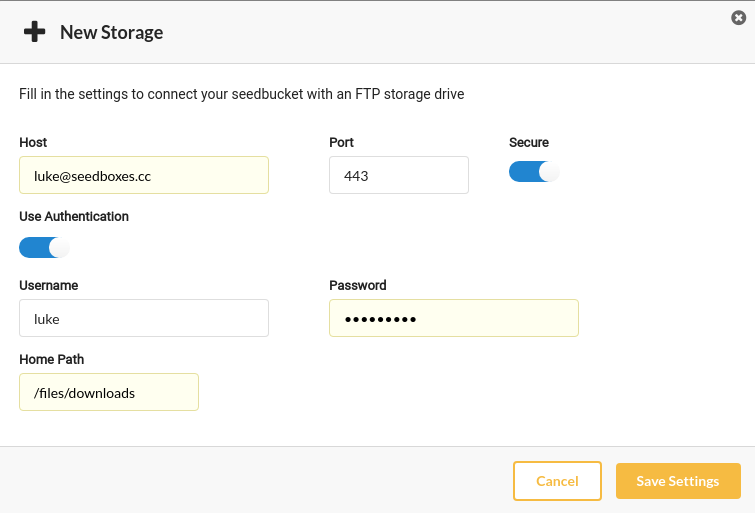 Your Seedbucket comes pre-installed with two dashboards; Local Files, for managing your local files and Torrent Client which by default is pre-configured to connect to your seedbox default torrent client. The process is very simple. 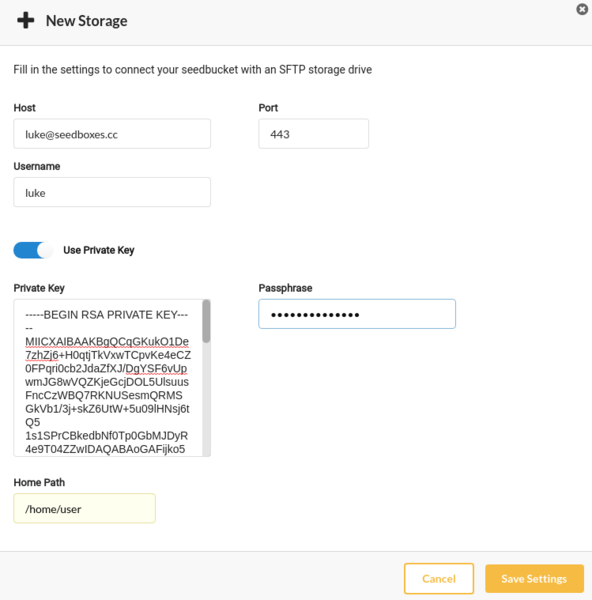 You basically need to create a new dashboard that you will connect with an external storage drive (e.g. 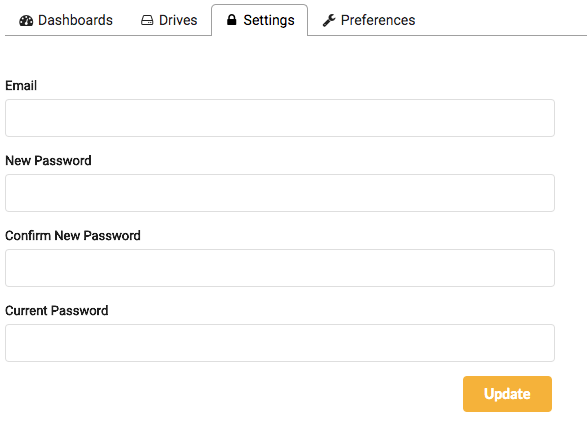 Google Drive) and then you will be able to access that storage from within a Dashboard. ssh-keygen -t rsa -m PEM - it can have whatever length you want, but the default (2048) is more than fine. 3) After you finish adding your external storage drive(s), you will be re-directed back to your Seedbucket. The new storage drive will be added which you will be able to choose and proceed with creating your new dashboard when you click "Next"
4) Fill in your desired name for your new dashboard, click "Add" and you are done! If you need to connect more storage drives, then repeat the above steps! And if you got several email addressess from the same provider, each with its own different cloud storage, you can add them all ! You can easily access your profile from the upper right corner by clicking on your username and then "Settings". From here you can manage all your dashboards. Just hover over the desired dashboard you want to manage and all available actions will appear which you can click and follow the instructions. NOTE: By deleting a dashboard, you remove it from your file manager but the dashboard remains in your "Drives" manager in case you need it again in the future. From here you can manage all your connected storage drives and also check their available disk space. Just hover over the desired drive you want to manage and all available actions will appear. Please keep in mind that not all drives have the same actions. There are some exceptions, like the Local File System drive, which comes pre-installed, and can not be deleted. You will also notice an action for the Local File System drive that is not available to the other drives, Index files which will force re-index all your files in your seedbox. NOTE: By deleting a drive from the manager, you remove it completely from your seedbucket. Your files will of course remain intact. In case you need it again in the future, you have to follow the same procedure of adding the storage and using it. From the settings page, you will be able to edit basic things like your email and password. Current Password is always required when editing settings. From here you can choose some default preferences that will be used globally. More preferences will be added in the near future. 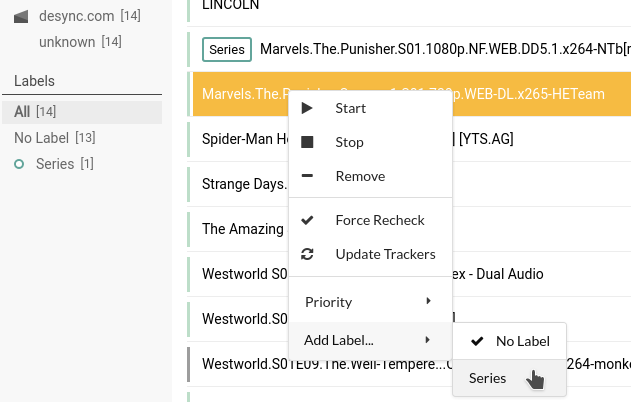 You can also add starred folders for quick access in move/copy to actions. This can also be done when you are browsing your file manager - check info below for a thorough procedure on how creating and using predefined (starred) folders. Seedbucket comes with a complete file manager that allows you to easily manage your local and remote files and perform operations on them. Mark a folder as starred folder for quick and easy access when you move/copy items to it. You can move files and/or folders inside the same cloud storage and to your folder of choice. Select the items and right-click for the modal to appear, then choose "Move" action. You can easily extract or create archives with a compression type and comporession quality of your choosing. Simply right click on the file or folder you wish to compress, select the output path and the compression settings and just click "Create". If you wish to extract an archive, simple right click on it, select "Extract". Creating torrents has never been easier! 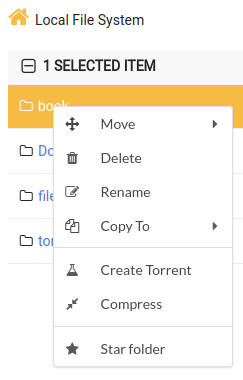 Simple select the files you wish to add to your .torrent, right click on them, "Create Torrent", enter your torrent settings and click "Create". 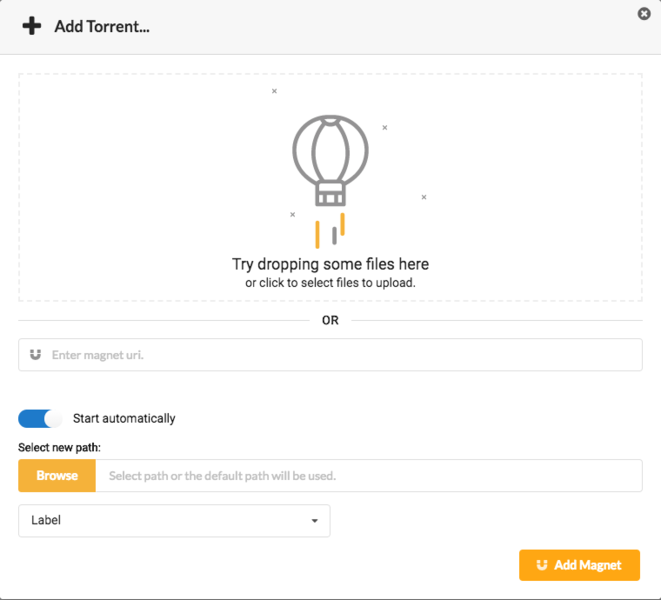 Torrent files with the appropriate .torrent extension, can be added in your torrent client in an instant. 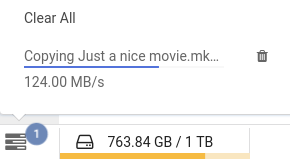 The torrent will be added to your torrent list to your connected client. You can easily share files (not folders) by simply selecting a file, right clicking on it and then "Share Link". A share link will automatically be generated for you which you can either destroy or copy any time in order to provide it to whomever you want to download the file. Please do make sure that you do not post those share links in public forums or chat rooms or else anyone will be able to download the file. You can choose the expiration time of the link (minutes, hours, days, weeks, months) and click "Share". And if you want to resend the same shared link, you can always come back later anytime but within the time limit you have set for the link's expiration time. Just head to your seedbucket, find the file that you have already shared and either click the "chain" icon which is at the "SHARED" column or right click the file and choose "Share link", just like you did when you created the shareable link. The modal will appear and you can now copy again the same link. NOTE: If you want to share a folder, you can create a compressed file of this folder and share that file. The user that will download it must uncompress it afterwards. Tired of having to re-upload a file due to a network error? 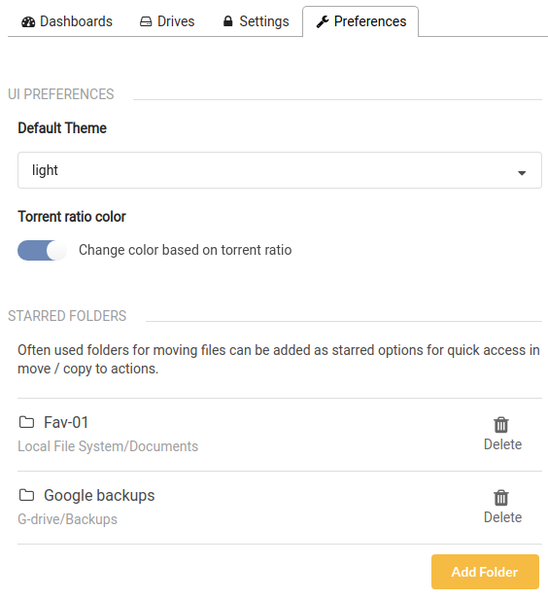 Then try our resumable uploads from within your file manager by simply clicking on the "Upload" button on the upper right corner. Drop the files you wish to upload and in case of a network error, then simply re-upload them and after they are quickly checked, they will continue from where they left off! NOTE: Resume capability currently applies only for your local files and not the cloud drives although we do plan to support it in the near future. Wouldn't you wish there was a quick way to choose folders that you frequently move/copy to, without having to navigate inside them again and again? 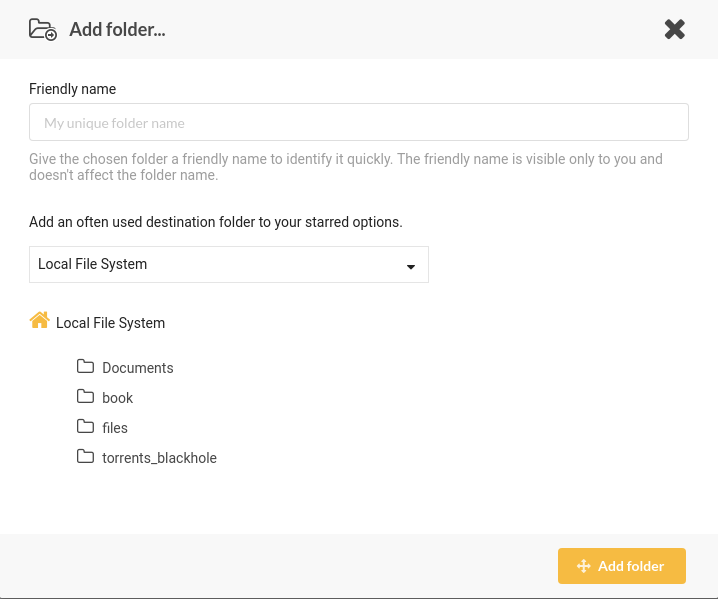 You can now set predefined folders of your choice, either at your local or cloud-based storage, and even uniquely name them however you want! This will not rename the original folder, it's just an easy reference name used by you. 1) Just right-click selected folder and choose "Star folder"
Bear in mind, the names you give at your predefined folders must be unique - you can't have the same reference name for different starred folders. If you proceed giving the same reference name, there will be a modal at the top right corner informing you that an arithmetic prefix was added next to it so you distinguish it from your already referenced folder. You can delete the reference name from a starred folder, just pick any option from above and reverse your actions. This will NOT delete the folder, just the reference name of it. Your file manager provides you the ability to easily copy files and folders within the same storage drive or between them. 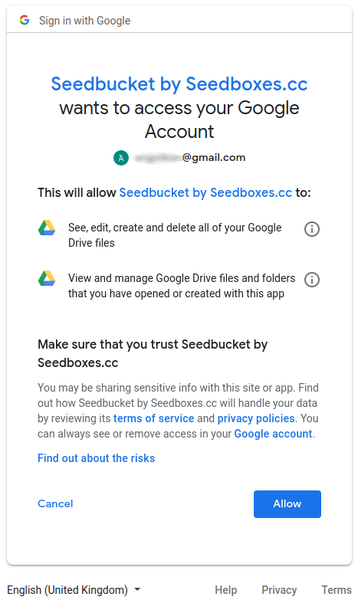 For example you can copy a file from your seedbox to your Google Drive or from your Google Drive to your Dropbox; any combination is possible. In order to copy a file or a folder simply select one, or multiple files/folders you wish to copy, right click and "Copy To". 1) Right click on the item(s) you want to copy and click "Copy To". A modal will appear which will allow you to choose the destination storage drive and folder. All your connected storage drives should appear in the dropdown list. As a quick option, if you have already set starred folders, you can directly copy the items to that starred folder. 2) Select the target drive and folder and click "Copy"
You can stop the transfer any time by clicking on the trash icon next to it. A common user interface for your rTorrent and Deluge connections is also integrated in Seedbucket. From here you will be able to control any local or remote torrent clients you might have. At the moment the Seedbucket torrent client is basic but new features are being added every day. Please note that some menu options might not exist in both rTorrent and Deluge connections and in some cases an action menu might not exist at all (e.g. in Torrent Files tab for Deluge). Just change whatever you need, click Edit and your torrent will be updated with the new values! where you can adjust the torrent's speed limit by dragging the slider or by typing the desired value. NOTE: Your changes will be applied when you close the context menu . In the top of your torrent list you will find the search input from where you can filter your torrent list and see immediately all results. Useful generic information about the selected torrent. The torrent file tree with useful information, such as the current progress of the file. 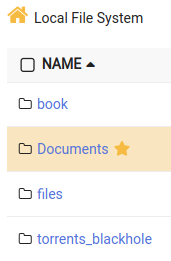 In addition, for each file there is an action menu (just right click on a file or click the three dots in the last column if you are in mobile view). NOTE: if you are connecting to a Deluge daemon then there is no action menu. 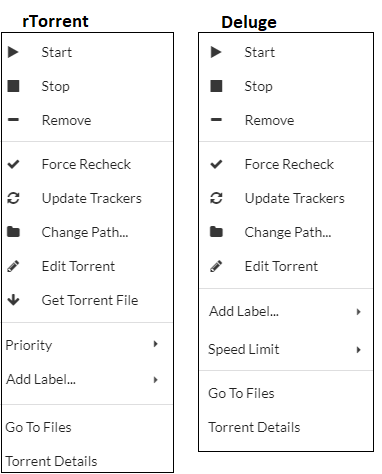 A list of all associated trackers with this torrent. If you notice on the screenshot above, there is a small lock icon which indicates that the torrent tracker is private. A list of connected peers while leeching/seeding. To modify your torrent client settings, navigate to Torrent Client Settings by clicking the gears icon located on the main toolbar. As you will see, your torrent client settings have their default values. Of course, feel free to modify them any time. To create a connection, navigate to Connection Manager by clicking the plug icon located on the main toolbar. As you will see, your seedbox torrent client settings have already been configured for you. Of course, feel free to add more if you wish any time. NOTE: Transmission is not currently supported. You can easily upload torrents to your torrent client by simply clicking the plus icon from the main toolbar. 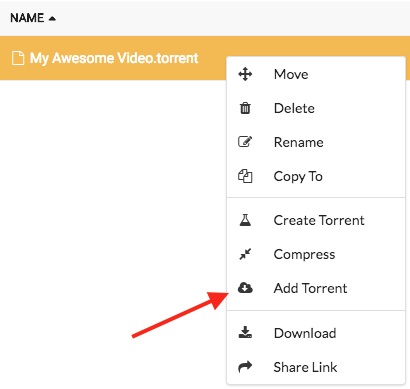 The following modal will appear which will allows you to either upload .torrent files or you can add a torrent using a magnet url. Adding new labels to torrents is very easy. Right click on your selected torrent and then click on the "Add Label..." menu. The menu itself is a text field, so once you click it a caret is going to start flashing and you can start typing. Once finished you can press Enter or click the "Add" on the right side. The label will appear on the left side of the torrent's name. Existing labels will appear on the right side of the "Add Label..." when you hover it so you can quicly add them to your selected torrents. You can also remove labels from the selected torrents by selecting "None". You can also modify the color of the label to the one you prefer. In torrent client there is a bottom bar where there are various global controls and statistics. 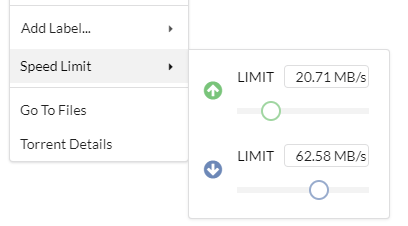 You can change speed limits just by clicking on the speed limit value you want(upload or download) and modify it by slider or by typing in the input that will appear. Seedbucket was created for YOU so your feedback is very important for us. You can easily send us any bugs, suggestions or anything at all from within your seedbucket by simply clicking on the send icon on the bottom of the left main sidebar. A modal will appear which you can write anything you want and even attach screenshots if it helps! Just started using this. It's been great so far. It's nice and fast, and works on every computer I own. One feature that would be great is a good bulk rename tool. And just some better tools for file management in general. 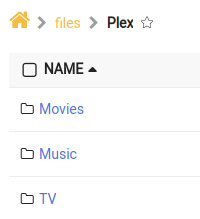 If i move my files to plex folder via seedbucket will they stop seeding? Spent a few hours trying to wrap my head around this but can't. The more I read about it the less I understand. Still no closer to figuring out what it is for or how to use it so I may as well get rid of it. I tried. Hey, I have kind of a stupid question. What does the Watch folder do? Does it auto add torrents that get added to this folder?